Most people think of Cary Grant as a suave leading man, but he is also an incredible physical comic. 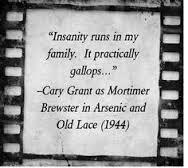 The dark comedy “Arsenic and Old Lace”(1944) directed by Frank Capra is the perfect vehicle for his slapstick comedic style. Grant plays Mortimer Brewster who, to his horror, discovers that his two darling elderly aunts (Abby (Josephine Hull) and Martha (Jean Adair) are in fact serial killers, bumping off those who they perceive as “lonely bachelor” men. Mortimer’s aunts epitomize the idea of sweet little old ladies. They can preserves, donate toys to the policeman’s children’s fund, make Elderberry wine. The problem is that their tasty Elderberry wine is spiked with arsenic, strychnine and “just a pinch of cyanide”. After Mortimer discovers a dead body hidden in the window seat he assumes that Teddy (John Alexander) – Abby and Martha’s brother – has committed murder under some delusion, (he believes he’s Theodore Roosevelt). 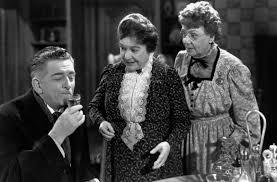 But the aunts are quite sincere when they explain to Mortimer that they are responsible (“It’s one of our charities”). The look on Cary’s face when he discovers one of the bodies in the window seat is priceless. The classic double take. Abby and Martha have the perfect set-up. The cellar of the family home becomes the burial ground for their victims with their brother Teddy aka Theodore Roosevelt digging the graves convinced he’s digging locks for the Panama Canal and burying yellow fever victims. And, as if his murderous aunts weren’t enough on Mortimer’s plate, enter long, lost brother Jonathan (Raymond Massey). Jonathon is a psychotic killer looking to stash a body of his own (Mr. Spenalzo). Also, to his annoyance, Jonathan is in need of another plastic surgery because his face bears a striking resemblance to Frankenstein thanks to his alcoholic plastic surgeon and accomplice Dr. Herman Einstein (Peter Lorre). Oh, did I mention the reason why Mortimer was actually visiting his aunts? 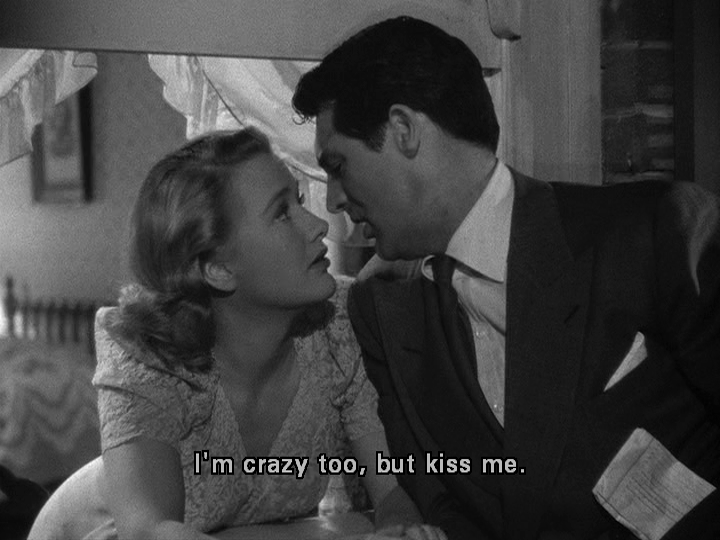 Well, despite having written several books ridiculing marriage as an “old-fashioned superstition”, Mortimer has fallen in love and has just married the irresistible next door neighbor, Elaine Harper (Priscilla Lane). The wedding took place that morning which is (and this is too perfect) Halloween day. When Jonathan discovers his aunts’ secret, he threatens to expose them if they try to turn him into the police. When the police come to the house to pick up Abby and Martha’s donation to the policeman’s children’s fund, Mortimer tries to hip them to Jonathan’s identify but it doesn’t go as smoothly as he’d planned. Chaos and hilarity ensue and this is where the monster mash fun begins. This entry was posted in Actors, Actresses, Classic Films, Comedy, Directors, Film History and tagged arsenic, Cary Grant, dark comedy, Elderberry wine, Frank Capra, Frankenstein, Halloween, murders, poison. Bookmark the permalink. 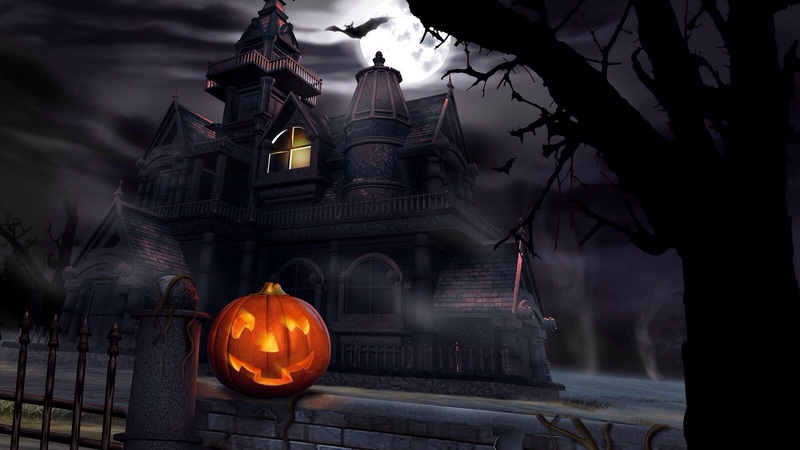 Halloween – Friday Night Frights!